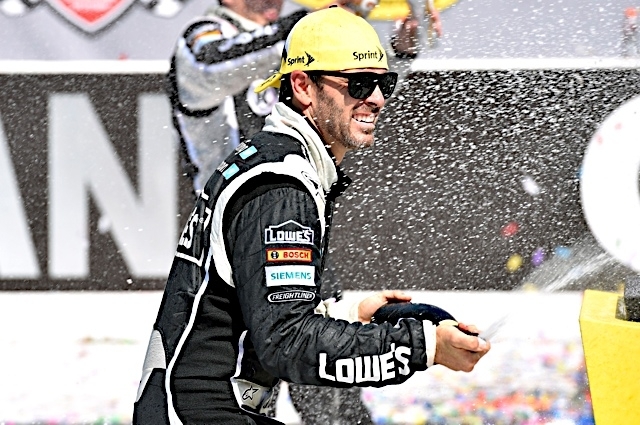 CONCORD, N.C. – It was an eventful year for Jimmie Johnson. In 2014, the six-time NASCAR Sprint Cup champion led his No. 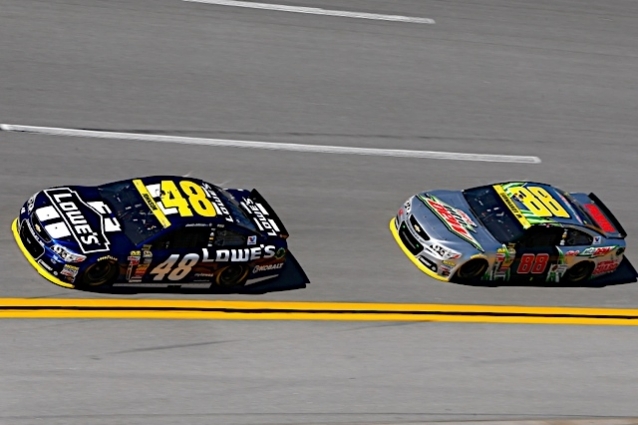 48 team to four victories, 11 top-five finishes and 20 top-10s. Now, Johnson and crew chief Chad Knaus look to next season, hoping to snag a seventh championship title for their team. But before new season begins, let’s take a look back at Johnson’s highlights from 2014. Johnson started the spring race at Charlotte Motor Speedway from the top position – and that’s exactly where he ended. 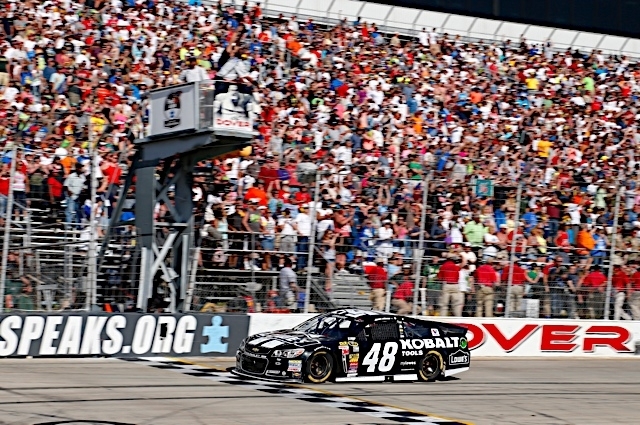 After leading for 164 laps, Johnson took the checkered flag at the 1.5-mile oval. With a new rules package in place, the win also punched the No. 48 team’s ticket to the Chase for the NASCAR Sprint Cup. The victory was Johnson’s seventh at the North Carolina track, which broke the record for the most all-time Cup wins at Charlotte. As it turns out, Johnson’s victory at Charlotte was just the beginning of a winning streak that would extend throughout the month of June. After taking home the checkered flag in North Carolina, he immediately tamed the Monster Mile at Dover International Speedway. Two weeks later, he was doing burnouts in his No. 48 Chevrolet SS at Michigan International Speedway. During his “summer streak,” Johnson led a combined 475 laps. 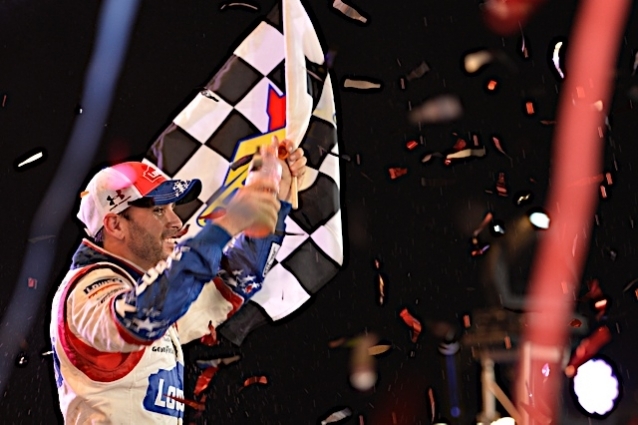 From celebrating with Miles the Monster at Dover to donning cowboy hats at Texas to kissing the bricks at Indianapolis, Johnson has been a part of many Victory Lane celebrations. Until this season, he had taken the checkered flag at 18 of the 23 tracks on the NASCAR Sprint Cup circuit. And after June’s race at Michigan International Speedway, Johnson was able to check another track off his list; the 38-year-old driver led 39 laps in his No. 48 Chevy SS en route to Michigan’s Victory Lane for the first time. It’s no secret that Johnson likes to run up front in a race – and it’s something he does often. For the past eight years, he’s led 1,100 laps or greater in each season. This year, he paced the field for more than 1,300 laps, ranking third among his Sprint Cup peers. 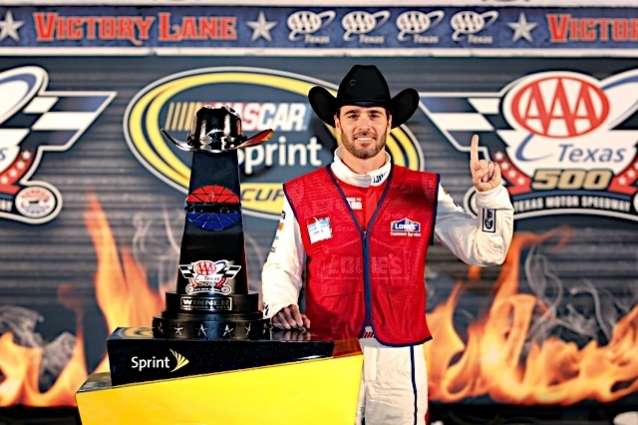 Johnson seemed determined from the drop of the green flag at Texas Motor Speedway in November. After starting third, he led 191 laps around the Fort Worth oval on his way to Victory Lane. And Johnson was joined in Victory Lane by several special guests – Lowe’s employees from throughout the country. The No. 48 team decided to honor the long-time sponsor by wearing the red vests that Lowe’s employees wear nationwide. Johnson’s Chevy SS also featured a red paint scheme to reflect the theme of the vests.